Strikeforce’s upcoming “Fedor vs Rogers” card on November 7th will still feature a women’s bout after all, as highly-ranked contender Roxanne Modafferi has stepped in to replace an ailing Erin Toughill and will face Dutch standout Marloes Coenen in a rematch from their 2007 battle. Modafferi, who regularly competes at 135 pounds, earned a Split Decision victory over Coenen in the 2007 meeting and became K-GRACE Tournament Champion in the process. 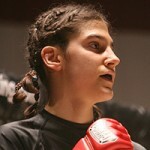 She will look to pick up her second victory over Coenen in her Strikeforce debut. Having already faced and beaten many of the sport’s top fighters, Modafferi (13-4-0) will at last make her long-awaited debut in Strikeforce, but the circumstances surrounding the fight are anything but ideal for the American who resides in Kanagawa, Japan. Expected to enter the promotion’s growing 135-pound division, perhaps in a title fight against undefeated Canadian Sarah Kaufman, Modafferi will instead move up in weight on nine days’ notice to face a very tough and dangerous test in Coenen. A talented striker, Coenen (19-3-0) has won three of her four fights since the loss to Modafferi, but two of those wins came against a vastly undersized and winless 17-year-old, Asci Kubra of France. Coenen’s most recent fight ended in a shocking upset loss to the debuting Cindy “Battlecat” Dandois, though many feel that the judges’ decision should have gone Coenen’s way. Both fighters will have a lot to prove in the fight, as Coenen seeks to avenge her loss from the pair’s first meeting while Modafferi looks to validate her victory and move on to greater things in Strikeforce. Modafferi has had difficulty in securing fights in North America due to her residence in Japan and she is taking a risk by engaging in the rematch with Coenen. Should Modafferi lose, there is no guarantee that Strikeforce will bring her back to be a part of the 135-pound division, which would be a loss for all involved. With few top challengers at 145, this appears to be a last-ditch effort by Strikeforce to bolster the division, whose stars are currently sidelined with injury, illness or acting careers. Where this leaves the 135-pound division, as well as the lighter weight classes, remains to be seen, but the promotion’s plans for its women’s division seem to be focused entirely on the short-term, with little thought to the future. The rematch between Modafferi and Coenen, just as with the originally scheduled bout between Coenen and Erin Toughill, will only air on the CBS telecast if the four main card fights run short. Strikeforce: “Fedor vs Rogers” takes place on November 7th at the Sears Centre in Hoffman Estates, Illinois, and airs live on CBS.